freedom | La même lune. In my last post I talked about how I found a place to stay, with my art teacher, Esther. After talking to Orton and the coordinators from the program, I decided to move to my new home. Living at Esther’s house was such a different environment for me. I am an only child. Besides living with Merve and Martina for those 2 months, my house was just me, my mom and my dog. My parents got divorced when I was 2 years old and although I see my dad all the time, I was used to just having my mom at my house to talk to. Esther and her husband, David, had 4 kids: Chris, Becca, Kerrie and Rachael. When I moved there only 3 of them were living at the house, but it was still a big family! I loved it. I’d stay up playing games and talking to Chris; Kerrie likes painting and sometimes she’d ask me to pose for her paintings or pictures; I talked to Esther a lot, about everything. She is a very fun person. We used to laugh a lot, do fun things, listen to loud music. She was really becoming a ”mom” to me. And Rachael, the oldest daughter, she is just the best. We’d watch movies together, make food, gossip. When I needed, she was always there to give me advices. Dave, the dad, was the funniest person, he loved chilli and he was always making jokes. It didn’t take long till I felt like I was a part of the family. Then Becca moved back to the house and it was even more crowded and I had one more sister to talk to and ask makeup and clothes and advices from. I loved it. Around the time I moved, I also started hanging out with a boy named Dylan, who was introduced to me by my area coordinator, Isabel. Her son and Dylan had been best friends since they were little. So Isabel took me to some soccer games (because I’m Brazilian I think hahaha) and I met him. I think we got along mostly because he has this latin blood that it’s hard not to notice once you talk to him (if you’re latin, I mean.) But just by looking at him you wouldn’t be able to tell, since he has blue eyes and long blond hair. I do too, and I’m soooo very latin. Esther’s house, or, my new home, was a few blocks from Dylan’s house, so we ended up hanging out almost everyday. We liked each other but when people called us boyfriend and girlfriend, we would just deny and say we were just ”talking”. It was a good plan, we thought we were being smart, at least at first, since I was leaving and getting involved would just complicate things. We ended up going out for over a year and a half. He was my first boyfriend. Who would’ve thought I would find a bf all the way in California? But it was great while it lasted, we had some amazing and fun times. Till I came back home….but c’est la vie! By October , I was more out of the house than in and Esther and I talked and decided it was better if I moved out. I spent a few months at Isabel’s house. And believe it or not, she has even more kids than Esther, so by then I can say I had 11 siblings. Four from Esther’s house, then Isabel’s 6 children plus her exchange student from Germany. I slept at Natalie’s room (the exchange student), on an inflatable bed. I was friends with Natalie already, and with all of the other ”siblings” so living there was not hard at all. Not all of them were living there when I did, only Trevor, Gabe, Kyle, Claire and Natalie. I still consider them to be my family. It was nice to stay at Natalie’s room because as an exchange student, she understood how I felt, she also felt homesick sometimes, she got frustrated with host family related issues, etc. It was, and it still is, good to talk to her because we went through the same things. She even dated an American guy, too. So we still talk about how hard it is to be back home etc. In December I came back to Brazil for 14 days, to spend Christmas with my family. My grandma was very sick and I didn’t want to be far from her around Christmas time. I was still dating Dylan, so when I was here, I called him on Skype a lot. Skype was one of the most important parts of my years abroad. It makes being far, a little easier. I went back to Cali to spend New Year’s Eve with my friends there, and it was really fun. After that, I went to a new family (which was actually the one that was supposed to be my family when I FIRST got in California…). The family was a couple: Jack and Elena. No kids. Two dogs. They took me in, made me feel at home right away. Elena is from Argentina, so we already had the South American thing in common. Jack is a smart guy with a lot of stories to tell. He, unlike the rest of the families I lived with, gave me a lot of freedom and not a lot of rules (except for calling him to let him know I was alright, sometimes :). Once I was at Dylan’s (which was literally one block away) and it started raining. I fell asleep and when I woke up it was 5 am. I was so desperate, I ran back home thinking Jack would be furious. He wasn’t mad, in fact, he told me ”You’re not a kid anymore. You’re 18. If an 18 year-old can go to war and shoot guns, you’re free to do what you want.” That was the end of it. I think Jack was like that, and understood me the most because he had lived in Brazil for years, earlier in his life, and he loved the country. He loves it, actually. So he understands how Brazilians are. And it was very good to live there. I loved listening to all his stories, talking to Elena, I even loved the dogs: Copernicus and Eloisa (who died last year :( ) . The year I lived at Jack and Elena’s house was very different from my past year in Pacifica. I was more independent and treated like I was an adult not just an exchange student. Jack was always extremely dedicated to my likes. He knew that I liked movies and old movies, mostly, and he was always talking to me about those things. Who knows me, knows I have this big addiction in…Frank Sinatra. So Jack took me to CalNeva, a casino that Frank used to own. One of the best days of my life. Being an exchange student is NOT easy. But it is, without a doubt, the best time of your life. 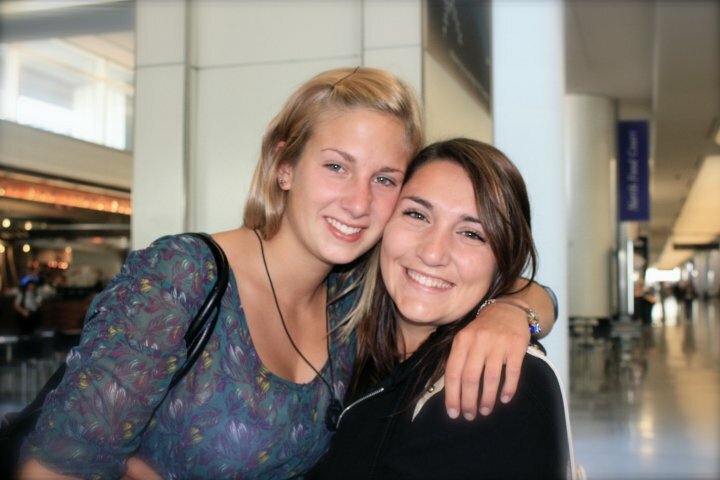 My German sister, Natalie and my American sister, Claire.